I have recently inherited a 5 bedroom house FULL of every kind of collectible you can imagine! And that's not even the dolls. But my main question is about a Franklin Heirloom doll from 1989. It's an Erte' design called "symphony in black". It's absolutely beautiful and is in perfect condition under a glass display case. I have searched the internet for a week now and can't seem to find really any information. I am mainly interested in its value as it is going to E-Bay(don't know of any other options-suggestions?). Now I will get back to listing more of the dolls I have. There's at least 4 from every company made. Thank You! Comments for Franklin Erte' value?? 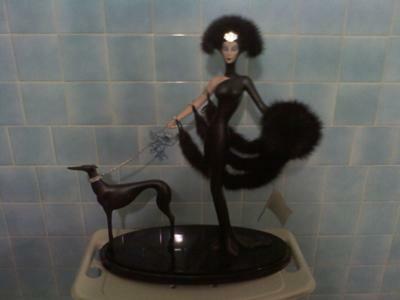 Ebay does have listings, present and completed, for the Erte` pieces. Not much action. However, on December 28th, this piece sold for $107.50. A very soft market now for selling, for sure.